‘Tis the season for entertaining. 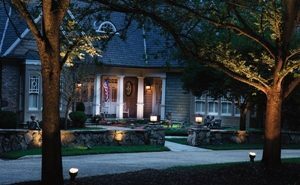 Perfectly placed lighting will make your home look warm and inviting as your guests arrive. CONVERSATION STATION: Shine a light on favorite gathering areas. Whether you want to create a gathering spot for all of your friends and family, or a more cozy conversation space, a distinctive, light-directing fixture is a great way to draw in your guests. You can define a space with something as simple as two chairs and a torchiere, a spotlight aimed toward a corner sofa or pendant grouping above a table. For maximum effect, consider an eye-catching chandelier to attract your guests to a main entertaining area. 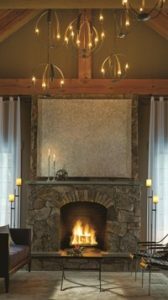 If the many lighting options seem a bit overwhelming, take a photo of your room to a lighting expert at an ALA-member showroom to get advice about the best and most economical way to create your perfect entertainment spot. 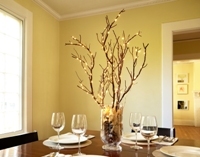 GLOW TIME: Add a spark to your holiday party décor. When decorating your home for a holiday party or just a few friends, think beyond typical seasonal ornaments, wreaths and Christmas tree lights. The sparkle of lights in unexpected places is all you may need to create a festive and warm atmosphere. Try adding battery-powered moldable LED string lights to a centerpiece, mantel, planter, bowl of pine cones or any place that could use a little spark. For more Holiday Lighting ideas, visit the Christmas Shoppe at our La Grange Location.